Planning to place products in the hands of people, a new wave of vending machines may prove enticing for those short on pocket change. 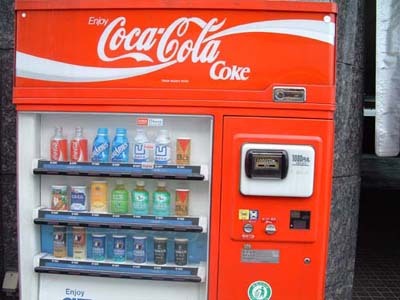 Vending company, Apex Corp., is in the process of creating vending machines that would give away free drinks (valued at $1 or less) in return for the user agreeing to watch a 30 second commercial spot first. Though the scheme may be genius in Apex's eyes, it seems to somewhat defeat the purpose of commercials. Typically, commercials are used as drivers to get the consumer to the point of purchase. What good does serving an ad to an already-thirsty vending machine customer do? At this point, vending machine food would be better off hiring the Berries and Cream guy to jump out after each purchase. At least then someone would be excited about the product. I would think staring at a Coca-Cola logo is advertising enough. Can I have a drink? If I sit on a NYC subway car that's plastered w/ Budweiser ads for 3 minutes, can I get a 6-pack?